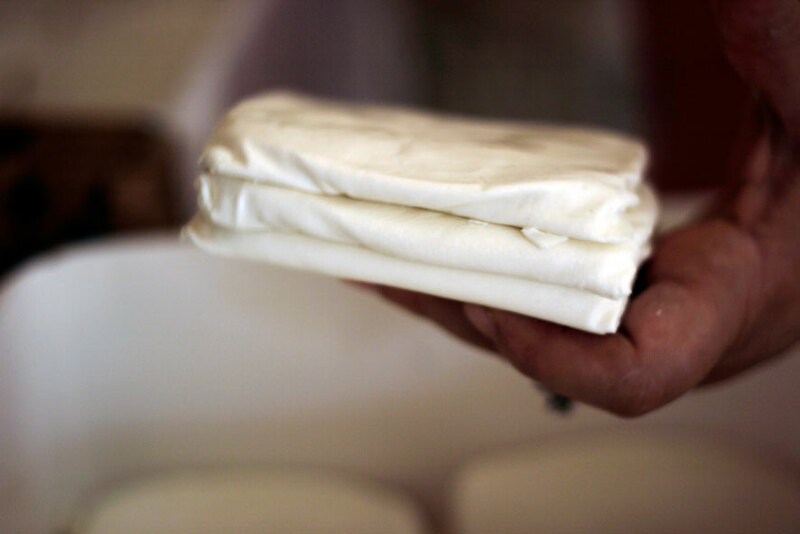 It´s the season of Jibneh here in Palestine and Bait al Karama just prepared 80 kg of tasty white cheese from the village of Yabad (Jenin). Yosra, one of our women, prepared it in the traditional fashion that her mother taught her. “My mother” tells Yosra “was preparing the cheese secretly when nobody was around. The cheese was so expensive (and still is) that my mother did´t want to prepare it in front of who could not effort it, in act of respect”. when I finished and my father entered the kitchen, he took a piece of the cheese I prepared and tasted it and said: it taste exactly how your mother used to do it! We start with a fast dip on each sides of the cheese in fine salt, to then let it stay for three days in order to drain the water. Each square piece is then sliced in four or six parts and then boiled in water with a cotton bag containing Gum Arabic and Mahlab (an aromatic spice made from the seed of the St Lucie Cherry) to give it its unique flavor. The cheese is then layered on a clean surface to cool down and spread with Mighella seeds (or black cumin). Finally the cheese is carefully placed into glass jars and topped with Gum Arabic and Mahlab. Due to its salty taste, is custom to boil the cheese in water before serving: Hot jibneh with pita bread and a sweet cup of tea with mint is simply delicious!